First and foremost, Passover is a holiday, so don’t be shy about using a nice tablecloth and fancy china. On the other hand, some people keep their Passover meals extra-safe from chametz (the dreaded, forbidden leavening) by plates they only have for Passover. So if you want to use fancy paper goods instead of china, feel free, whether in the name of being extra-kosher or just not wanting to wash a million dishes after the seder. Because the seder is all about conversation, avoid tall centerpieces – everyone should be able to see one another across the table! 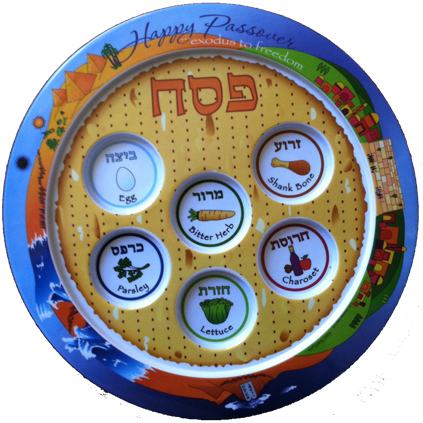 Plus, there’s not likely to be room for elaborate flower arrangements, thanks to some special additions to our table: the seder plate, the plate of matzah, and Elijah’s cup. In some homes, they’ll also add a couple of condiments that come in handy during the seder, such as a cup of salt water and a dish of horseradish. Many of my favorite Passover recipes originated with my late Aunt Lois. This one isn’t only delicious — it’s super easy! 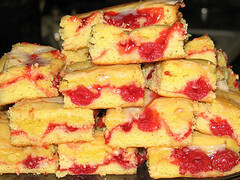 The Cherry Nut Squares freeze well and make great desserts at seder and snacks throughout the week. Preheat over to 350 degrees. Combine all ingredients and place in a 9×13 pan. 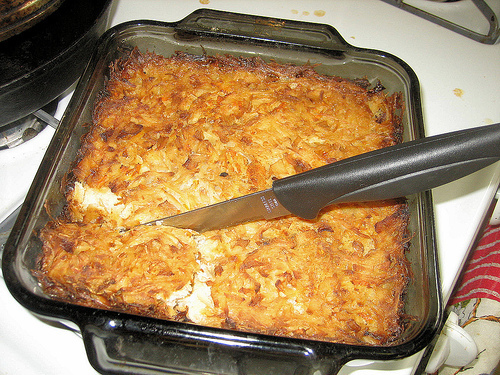 Bake 30-45 minutes, until the top is lightly browned. Enjoy! Photo is under Creative Commons licenses; please click here for sources. My Grandma Ida was famous in our family for two talents: her knitting and her baking. She passed away almost a decade ago, so I’m grateful that I can still snuggle up beneath the afghan she knitted for me when I was much younger. And I’m grateful that she taught my mother some of her best recipes, including thie Passover cake. 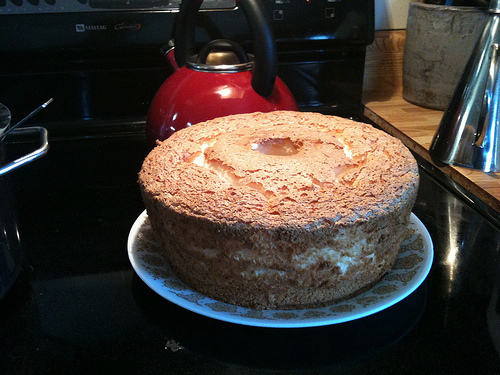 I’ve never attempted this one myself, but my mother likes to tell the story of how she tried unsuccessfully for years to replicate her mother-in-law’s cake using the recipe… but it wasn’t until Grandma Ida stood with my mother and they made the cake together that it finally came out right. One of these days I’ll have to make sure my mother stands with me so I can learn to bake it. Preheat oven to 350 degrees. Beat egg whites until stiff; gradually add half of the sugar. Beat yolks with remaining sugar and salt; when yolks are thick and light in color add the oil, only a little at a time. Then add the wine and the cocoa, beating at a low level. Gently fold the cake meal/starch mixture into the whites, then fold in the yolk mixture throwing the nuts in at the same time. Bake in an ungreased tube pan for 50 minutes. Turn over and hang from a two-liter bottle until cooled. 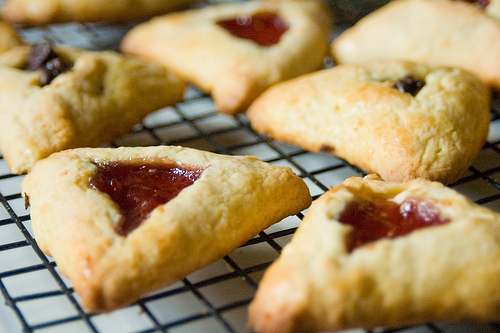 A week or two ago, I posted a recipe that foolishly claimed to be The Easiest Hamentashen Recipe on the Internet. Liz, our community manager, rightfully pointed out that any recipe with seven ingredients and nine steps can’t possibly be the easiest, and we challenged ourselves to concoct a new recipe that could be made in a dorm room without a kitchen. Taking our inspiration from Sandra Lee, we decided to make “Slacker Hamentashen,” using only store-bought pie-crust and filling. That’s right–two ingredients. And we baked them in our office toaster over. 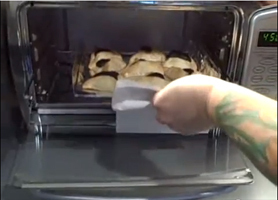 Check out the video for our “recipe,” technique, and taste-test. A big thank you to our intern, Michelle Goldberg, for her fine camerawork! And to jaycut.com for being a better video-editing tool than I ever expected to find for free on the web. Ten years ago, I taught my very first Sunday school class, a group of awesome sixth-graders who came twice a month to the (late, lamented) Silverlake/Los Feliz Jewish Community Center in Los Angeles. That particular JCC primarily served families with little other connection to the Jewish community, so we felt a special obligation during classes to give the kids the best possible taste of Judaism we could.